Moscow, June 19, Interfax - The Resurrection Church of Slavyansk was shelled on Thursday, the church ward was killed. “Today, exactly in 06:00 a.m. the city was shelled from the Karachun Mountain. The shelling lasted for half an hour. This time the Resurrection Church has been their target. The shells exploded right near it, one of them went in half a meter from the dome, the second one exploded not far from the church territory, on the road, the third one tore apart a gas pipeline,” the press service of the Slavyansk Diocese cites the Dean of St. Alexander of Neva District in Slavyansk Archpriest Nikolay Fomenko as saying. According to him, “the southern facade of the church was damaged, but not destroyed. “But what is the most terrific – the church ward was killed. He was going to open the gates, when a piece of shell smashed his head. He was taken to hospital, but doctors didn’t manage to save him. We ask to pray for late Alexander,” the priest said. The Resurrection Church was built in the 18th century. St. John of Kronstadt stayed and celebrated divine services in it. As was reported, St. Seraphim Church in the village of Cherevkovka not far from Slavyansk was shelled Monday night. Several shells managed to reach the church yard. The chapel and canteen were fully destroyed. 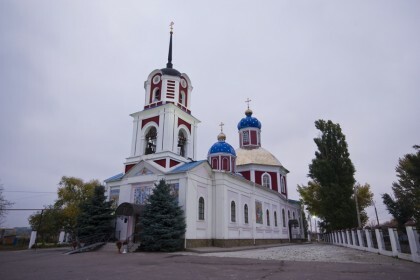 Late in May, the Church of the Derzhavnaya Icon of the Mother of God in Slavyansk was damaged. During the shelling, a mine exploded in ten meters from the church. Its piece broke five windows, damaged the facade and destroyed the church fence.